Two books have been guiding my thinking about research & inquiry cycles for the past couple of years. 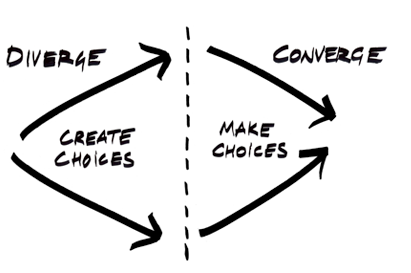 a) Change by Design -- by Tim Brown, of IDEO "design thinking" fame. 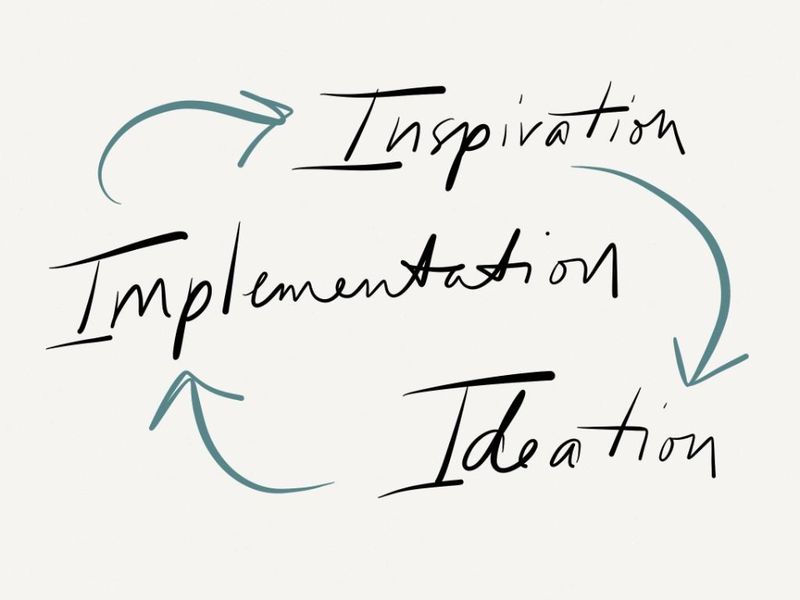 His framework is not explicitly educational, though IDEO have published a toolkit of design thinking for educators. b) Guided Inquiry Design: a framework for Inquiry in your School -- by Carol C. Kuhlthau, Leslie K. Maniotes, and Ann K. Caspari. Kuhlthau is the grand dame of teacher-librarianship and the one who first recognized the emotional element involved in the ISP (Information Search Process) back in 1991. For me, the most important feature they share is the recognition of that emotional element in research. We all get discouraged - or should. If you don't experience any dip in confidence, then it means you're not really pushing yourself in terms of researching. Tim's sketch illustrates Carol's original insight very well. 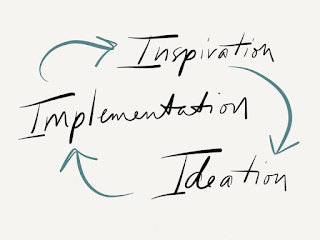 Tim's design process is an incredibly simple iterative cycle between Inspiration, Ideation, and Implementation (below is my sketch) -- but I think it works just as well in terms of research. 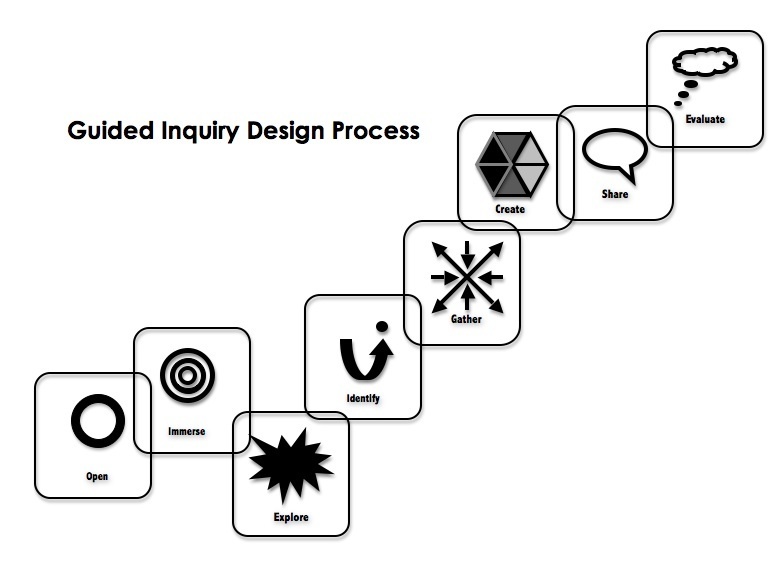 Carol's book offers plenty of practical suggestions for implementing inquiry in schools, e.g., she stresses the need for an Inquiry Journal (a workspace for individual composing and reflection) as well as Inquiry Charts (attempts to visualize ideas, connections, questions, etc.) and an Inquiry Log (a record of sources consulted), but one of the most important points she makes is the crucial distinction between the Explore and the Gather stages. The Explore stage is about browsing, scanning, and skimming. "Dipping in" means you need to relax, read, and reflect. Sources should just be tracked in the Inquiry Log at this point. The Gather stage is about detailed note-taking, comprehensive searching, and "going deep". This is also the stage when you need to thinking about citing, quoting, and paraphrasing. Too often students think they have to take detailed notes on a source the first time they encounter it - before they have decided on an inquiry focus. Again, Tim has a simple distinction which I think epitomizes the difference. When talking to students, I now like to have them clarify which mode they think they are currently in. And the emotional dip of uncertainty is often a sign that's time for the shift. 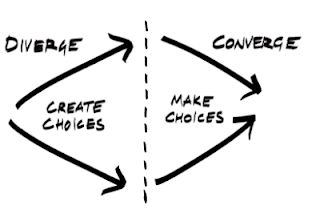 What a metacognitive skill -- to know how much first stage searching is enough to work with -- to have enough choices. 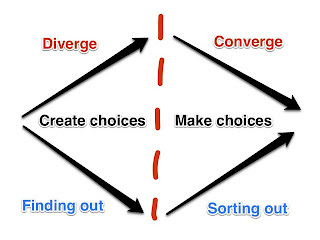 This is Carol's Identify stage -- which is about focusing and establishing a meaningful inquiry question -- when the thinking shifts from divergent (broad) to convergent (deep). Tim Brown insists all ideas (i.e., research questions) must be analyzed in light of three criteria: Desirability (personal interest/passion), Viability (for Tim this means "makes business sense," but in the educational realm it translates to "fits the assignment or criteria" and satisfies the big "so what? "), and Feasibility (the time and resources to actually complete the project). Similarly, Carol asks students to consider their question in terms of the assigned task, their own interest, the time available, and the information and resources available. I think Tim's four basic illustrations concisely convey the key stages of research better than Carol's more elaborate theory. I still want her book on my shelf, but, until I can get more teachers to read and absorb it, I'll be using Tim's ideas and images in conversation.